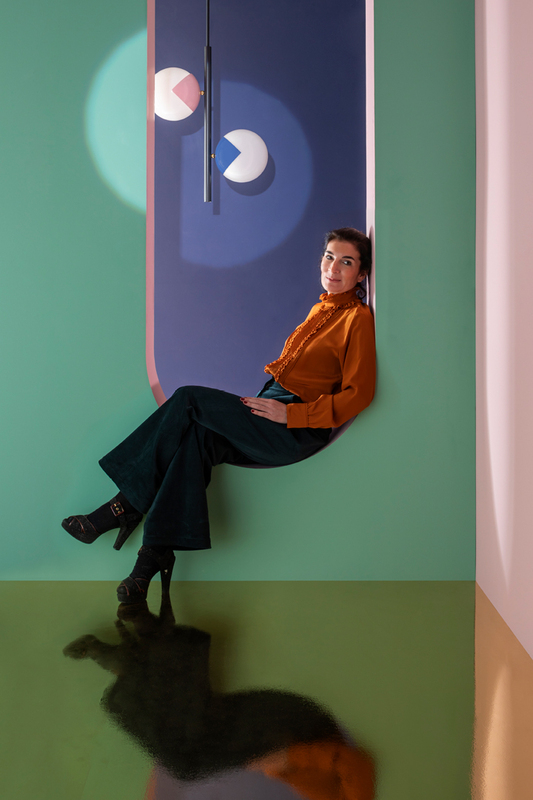 Rethinking, reimagining, redesigning familiar objects that we look at every day without ever really seeing them and using lighting to tell stories, this is the way of Marie-Lise Féry. A new take on our urban heritage, changing our perspective through her work on scale and usage. Since 2016, Magic Circus Éditions has been setting the world of lighting ablaze, creating aerial, playful and magical designs that merge retro with sleek and contemporary. A free-spirited antiquarian, founder Marie-Lise Féry draws inspiration from the world of cabarets and the magic of the circus to give form to imaginative, fun and playful collections. The air of magic she breathes into her work makes all interpretations possible and widens possibilities for creative interiors. The combination of traditional savoir-faire – outstanding craftsmanship – and her imaginative take on historical designs from our daily lives lends an unexpected and charming quality to her creations. Brass, mouth-blown glass, bespoke finishes and majestic proportions: each collection is modelled to provide an original perspective on those so-called ‘everyday’ objects, in an effort to produce 21st-century vintage. Féry’s lights are designed just like magic lanterns – precursor to modern-day cinema –, inspiring wonder through oversized, seemingly weightless compositions and understated references. Her poetic imagination takes us on a journey through time (from yesterday to today) and space (from outdoor to indoor). Each collection follows its own inspiration: the first models of street lighting for Collection 01, the Far East for Collection 02 and the colourful, carefree spirit of the 70s for her latest collection, Pop-Up. Bringing the era’s hedonism back to life through soft, lustrous and glossy colours, she highlights its narcissism and nonchalance. Magic Circus Éditions founder Marie-Lise Féry was born in Paris. After studying art business, she moved to New York to start her career. Fascinated by the city’s architecture, she found an endless source of inspiration in the Big Apple’s monumental décors. Returning to France, she chose to base herself in Lyon, where she opened an antiques gallery named Un Château en Espagne, and started telling her own stories through objects she gleaned here and there. A way for her to perpetuate her mother’s motto: “Objects with a soul will always find their place”. Since 2015, the year she established Magic Circus Éditions, she has moved on to lighting as a means of telling her stories, bringing the magic of the show into home interiors. With her love for the theatre, the circus, turn-of-the-century cabarets and music halls, Marie-Lise Féry imagines each new original creation as a way to stage her vision. In the manner of Wes Anderson in Grand Budapest Hotel, blending together elegance, humour and unexpected details, her designs never fail to surprise. Like magic lanterns – precursors to modern-day cinema –, Marie-Lise Féry creates a succession of illusions, with immense, lightweight compositions conjuring silent references. Attentive to the look of her pieces both in daylight and at night, Marie-Lise Féry takes us on a journey through space (from outside to inside) and time (from yesterday to today).